Choose from over 75 weapons and duke it out with the most famous animated cat and mouse duo ever. This page provides an overview of Tom And Jerry : War of the Whiskers, and provides a small selection of links to places where you can find cheats, game guides, and reviews. If available, you can find many additional cheats, guides, and reviews for Tom And Jerry : War of the Whiskers by using the tabs above. We have cheats for Tom And Jerry : War of the Whiskers, and know of 7 other websites with cheats. 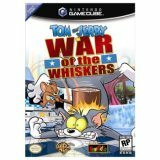 We have 6 user reviews of Tom And Jerry : War of the Whiskers, and know of 2 professionally written reviews.